You can see from the pictures above that it is important that the home inspectors do a carefull inspection of the attic areas to insure that all venting exits through the roof. These pictures are from two separate home inspections that I did over a couple of weeks. 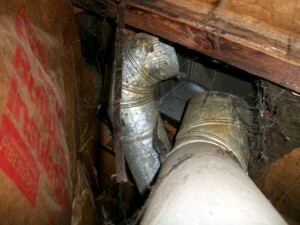 In each case, the home owner had added either bathroom and/or kitchen exhaust vents and terminated then in the attic. They were all aimed at a roof vent in an effort to exhaust to the outside. You see in the one picture that the handy work failed and the duct never even made it to the roof vent. To insure proper ventilation of bathrooms and kitchens it is important that all vents exit the roof through proper roof vents. 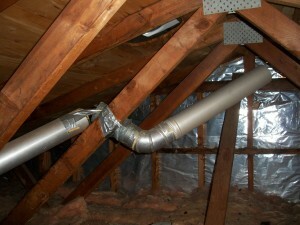 Venting to the attic adds moisture to the attic area which can result in icing and excess moisture in that attic area. Newer PostHome Inspector Asks, Is Your Air Conditioner Ready For Summer?